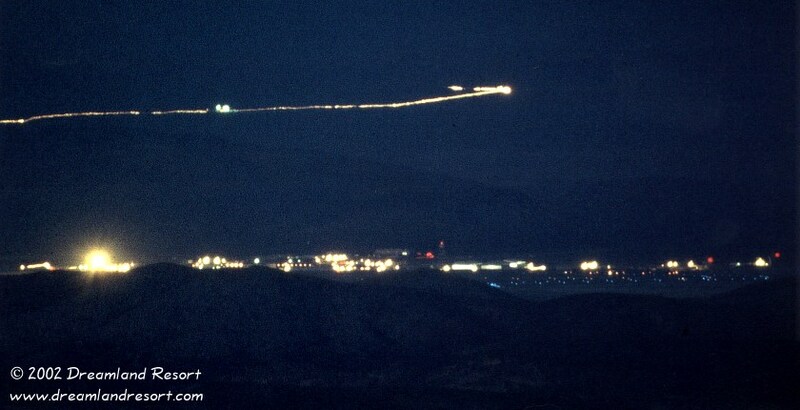 These excellent photos of Area 51 at night were taken in September 1995 from Tikaboo Peak. Special thanks to the photographer, German scientific journalist and author Andreas von Retyi, for his friendly permission to publish them here. Andreas has published several excellent books in German about Area 51 and other secret bases, and has spent a lot of time in the area on various research trips. His best seller Geheimbasis Area 51, published in 1998, is a standard work in German Area 51 literature. In summer of 2001 I had the pleasure of showing Andreas the latest developments at Area 51 for his new book Streng Geheim - Area 51 und die Schwarze Welt. This photo shows the area between Hangar 8 in the south (left) and Hangar 4 in the north (right). The bright light in the center is the Janet terminal. Hangar 18 on the left is barely visible, and to its left the lights of the P.E. Building, Fire Station #2 and Hangar 8. To the right are various street lights and office buildings, and on the far right the lights of Hangar 4, one of the Red Hat hangars. The runway lights can be seen in the foreground on the left. 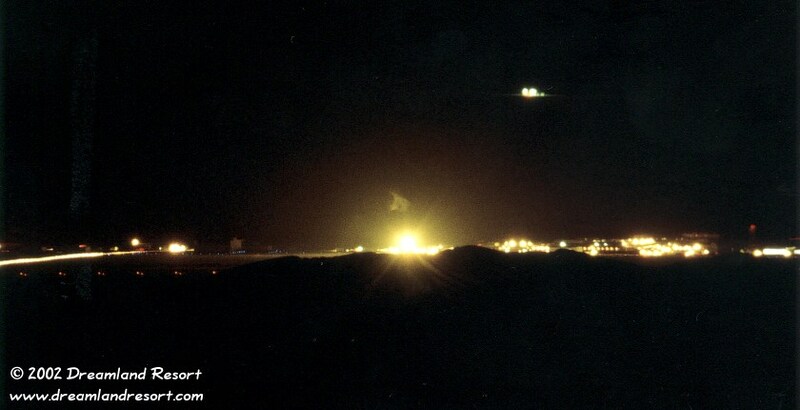 The lights above the base belong to a small facility in the background, behind the Papoose Mountain Range. This photo shows the area between the Janet Terminal in the south (left) and the two large radio dishes in the north (right). The dishes both have a red light on top. The blue taxiway lights and the runway lights can be seen in the foreground. The band of light in the background is a vehicle driving towards Area 51 from Station 700, the gate to the Nevada Test Site.